Mark your calendars! 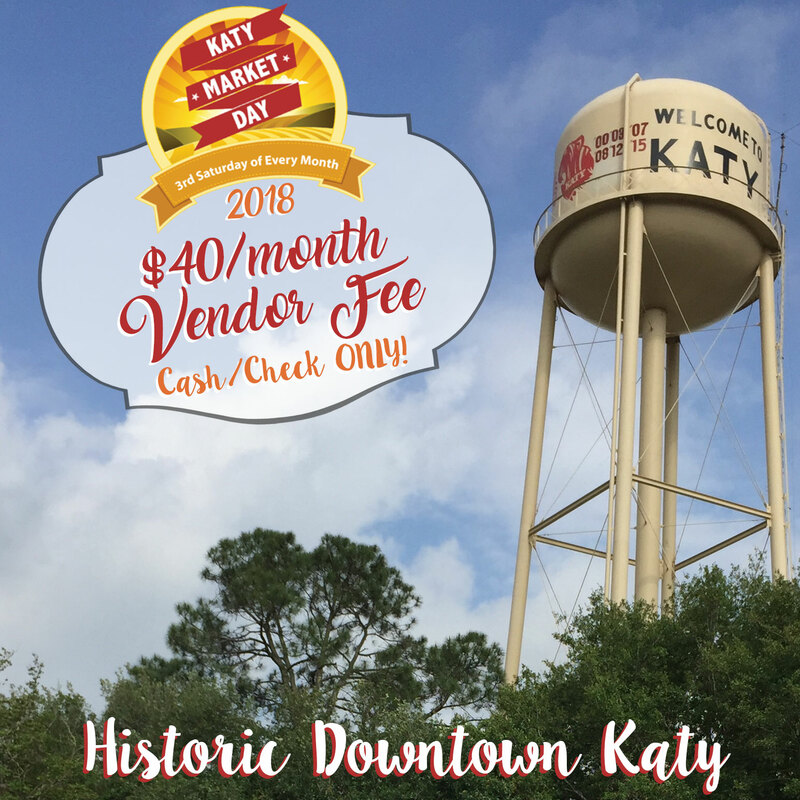 We are very excited for our JUNE Katy Market Day on Saturday the 16th, 2018 from 10am-4pm in our beautiful brand new Historic Downtown Katy! 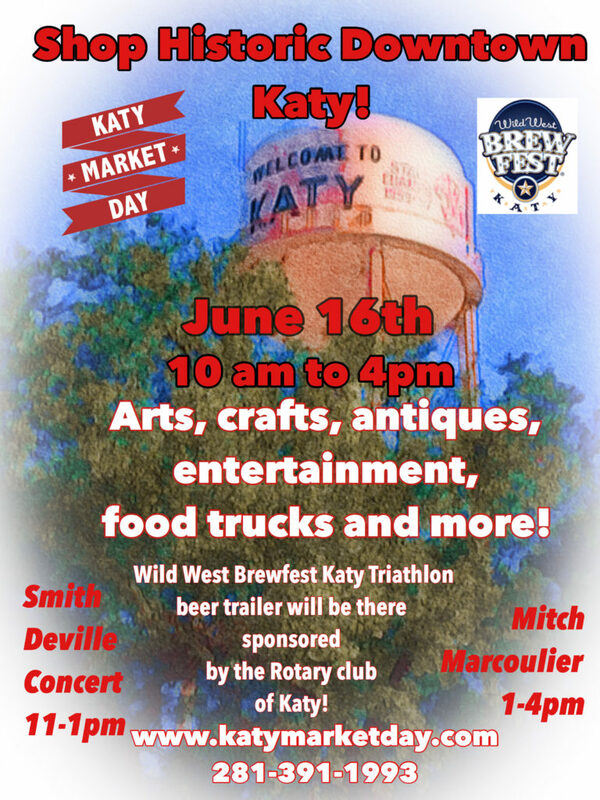 We will have 60 outside vendor booths, food trucks, Wild West BrewFest beer trailer & TWO FREE LIVE MUSIC ACTS at this market event! You don’t want to miss it! While you are in town shop our great boutiques, antique and gift shops and enjoy our visiting food trucks and local restaurants! 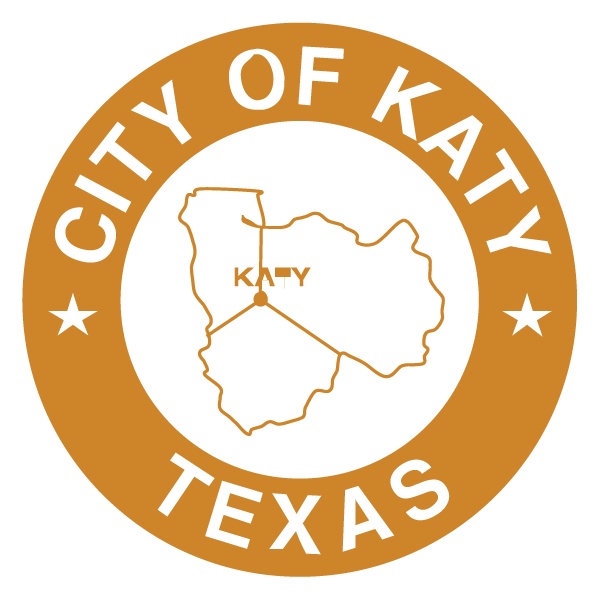 Please look for our Historic Downtown Katy Shopping & Dining Guide pdf document on our website soon! Featuring TWO FREE LIVE CONCERTS featuring Smith DeVille Music 11-1pm & Mitch Marcoulier 1pm-4pm! 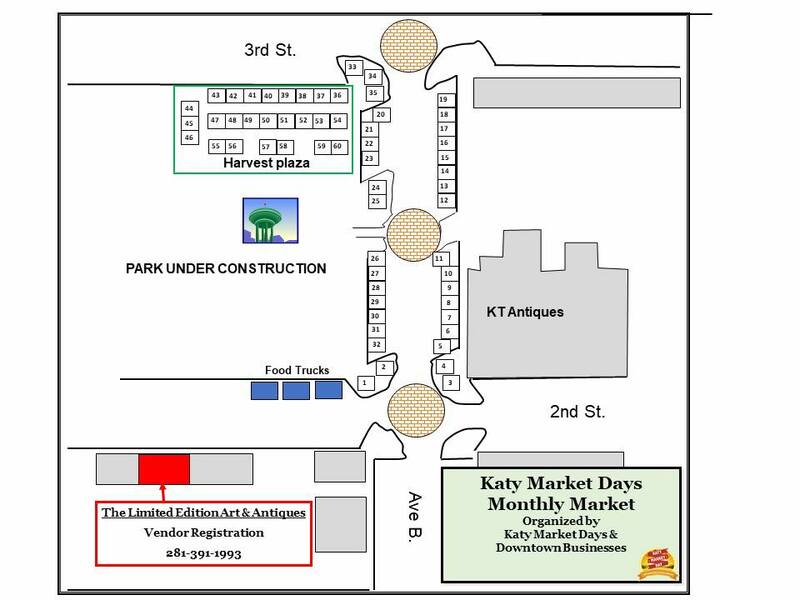 Contact us at 281-391-1993 or by email info@katymarketday.com | Like us on Facebook! VENDOR REGISTRATION = CLOSED/FULLY BOOKED! Vendor fee is $40 per market (cash/check only – no cards/paypal/online payments). We love our awesome vendors! 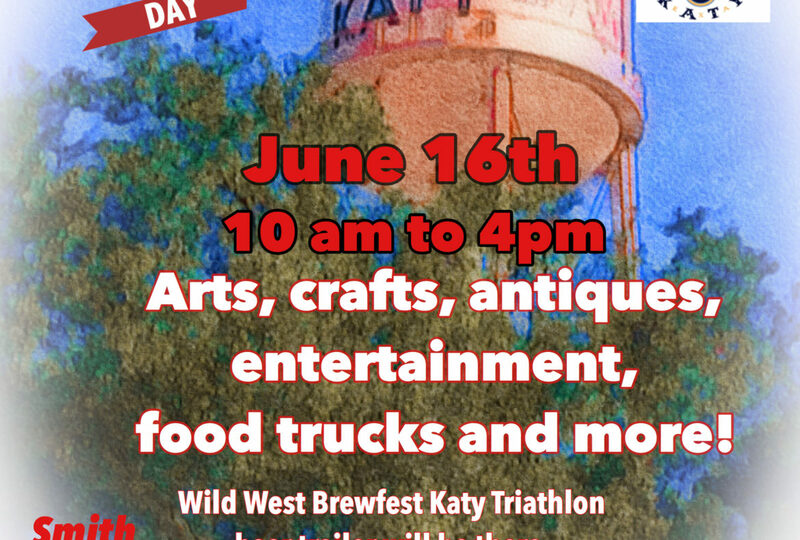 We have a variety of rotating vendors from exotic plants to great antiques, jewelry, art, crafts, gifts, soap, honey, clothing, makeup, home decor, accessories and MORE! Some returning & some new vendors every month! The one thing our vendors have in common is they have something to sell! We are a venue for crafts and the like, not a venue for advertising/soliciting your business! So if you just want to pass out flyers about your business, this isn’t the venue for you. This is a market only!! Thank you for your understanding! Want to be a vendor to sell your arts, crafts, produce, antiques and collectibles? Vendor fee for the new year is now $40 per each market event – Register your booth at the Limited Edition Art and Antiques Katy Market Days shop located at 5717 2nd St., Katy, TX 77493. 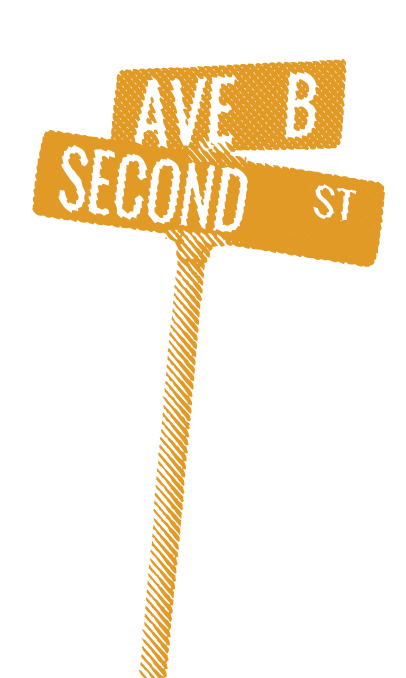 *Sorry, we can not reserve or hold space earlier or by phone, first come first serve at the shop. March market graciously hosted by The Limited Edition Art and Antiques. FULLY BOOKED 2018 – Sept, Oct, Nov & Dec!